Not everything is horrible these days for the Los Angeles Dodgers. At least they have Andre Ethier (pictured above) swinging a big bat. But there has been one lone bright spot in Dodgertown. That bright spot is not Kobe Bryant, though his courage and amazing toughness is a shining light in that city. Say hello to Los Angeles Dodger’s star right fielder, Andre Ethier. Ethier has been simply phenomenal this season, and is a main reason why the Dodgers are currently playing 500 baseball. Without him, the entire ship may have already sunk on this season even just 26 games in. 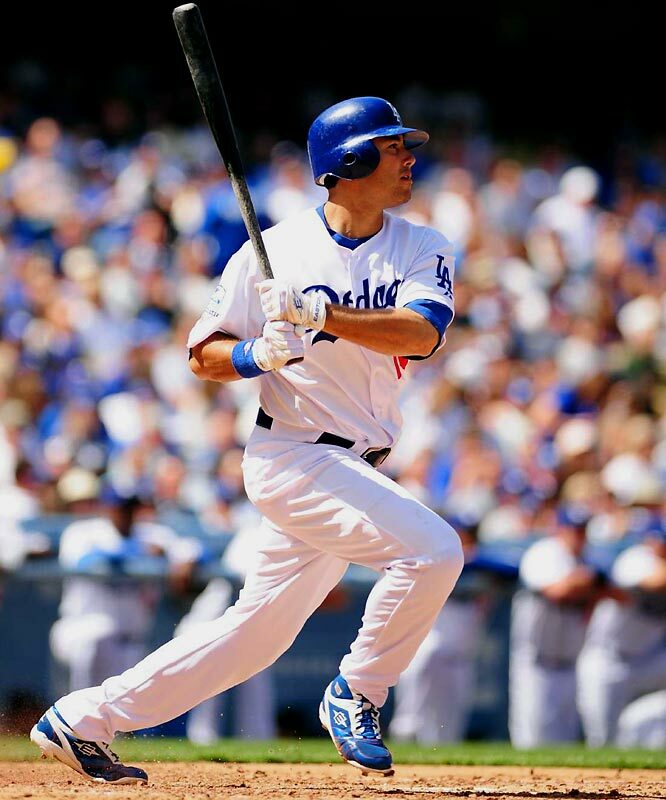 Ethier is another one of those players in the 5th/6th year of his career ready for a breakout. Sure Andre has been solid the past couple of years. In 2009, he hit 31 HRs to go with 106 RBIs. In 2010, he was also very solid, 23 HRs and 82 RBIs in an injury shortened campaign. But in 2011, he has hit that elite status. The guy has hit safely in 24 consecutive games. He is batting an astonishing .380. And continues to come up with the big hit for LA time after time. Today was another example of his knack to come up big in key situations. On this day, Ethier hit the game winning homer in the 10th to give LA a much-needed extra inning victory over the Florida Marlins. Tomorrow, he could be hitting a walk off homer to send LA to the playoffs..
Maybe that is a bit of wishful thinking, but the 29 year-old is the real deal. He is hitting the prime of his career. Expect the big numbers to keep coming. And at least not everything is going horrible in Dodgertown. They at least have the loan ray of Ethier to brighten up the day. This entry was posted in MLB and tagged Andre Ethier, Colorado Rockies, Florida Marlins, Kobe Bryant, Los Angeles Dodgers, Los Angeles Lakers, MLB, NL West. Bookmark the permalink. Not so fast…..his outfield-mate there in dodger town, Matt Kemp, is number 1 in fantasy right now. But I have both of them so I can’t complain. True true. But not too much has gone right in LA this year outside of the Outfield..